AFC Bournemouth manager Eddie Howe spoke to the written media after the 2-0 defeat at Cardiff City. 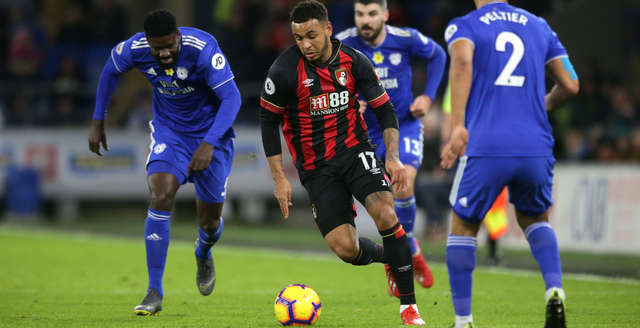 Early goals conceded proved costly for the Cherries, and the manager was frustrated at the defending which gifted two goals in Wales. We made it difficult with the way we conceded the first goal. It gave them a huge lift and the manner of which we conceded it to, it was a strange goal. Goals change games and to concede right at the start of both halves made things difficult. It's hugely disappointing as we really wanted to build on what we've done. We thought the Chelsea game could've been a turning point for us and we're really searching for consistency. We've never felt like we've got that, we go away from home and we feel really disappointed today. There's time to reflect and focus on Liverpool but to sort out our inconsistency is the biggest challenge. We can't play like we did on Wednesday then play like we did today - the mental side was a factor today. David injured his ankle scoring against Chelsea. It was a strange injury, he didn't feel it kicking the ball but felt in the celebration that he injured himself. He'll be missing for around three weeks we think.